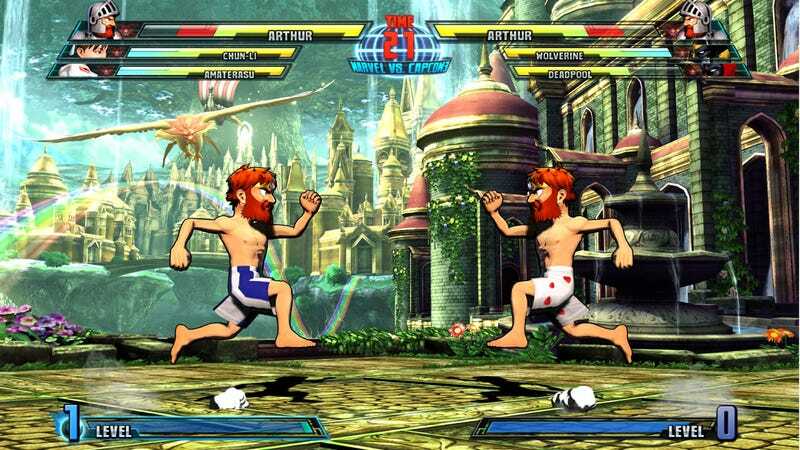 Arthur, seen above in nothing but his famous boxer shorts, appeared as an assist character in Marvel vs. Capcom. According to Capcom, the knight will fight with all the moves, weapons and attacks he had in the original side-scrolling platforming series. Spencer, from Capcom's attempt at a 3D Bionic Commando game, will also appear. Here are some screen shots of Arthur and Spencer in action, featuring another new addition. See it? Alternate costumes for both Spider-Man and Deadpool. I wouldn't be surprised to see Mr. Spencer get a more warmly regarded alt costume. Update: It appears that Marvel may also have two characters for its side to announce, as images featuring Magneto and MODOK seem to have prematurely escaped from the House of Ideas.